In 1876, the outlaw Clelland "Clell" Miller was buried at Muddy Fork Cemetery in Kearney, Missouri. You can visit his grave. But the body interred at Muddy Fork may not be Miller's at all, as 3D scans of a skeleton discovered in Grand Forks, North Dakota – purported to belong to Miller – now show. Above left: A postmortem photo of Clell Miller with an illustration of how the skeleton aligned. At right, the skeleton is superimposed over the image of Miller // Photo Credit Brandon Nichols. Miller, a member of the infamous James-Younger Gang, was shot dead during the gang's failed raid of Northfield Minnesota's First National Bank. Gang member Bill Chadwell was also killed during the botched robbery. The outlaws' bodies were photographed soon thereafter (below, Miller at left, Chadwell at right), then buried in Northfield. Miller's father is said to have later claimed his son's body so that he might see it buried in his hometown of Kearney, MO. But a forensic investigation recounted in the latest issue of the Journal of Forensic Sciences casts doubt on this version of history. 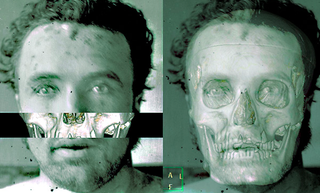 The study, led by University of North Carolina Wilmington researcher James Bailey, cross references photos of Miller and Chadwell with 3D scans of a skeleton discovered in North Dakota (purported to belong to one of the two outlaws) by way of a fascinating technique known as "craniofacial superimposition." In a nutshell, the technique involved overlaying photographs atop the 3D scan of the North Dakota skull and determining whether the observed facial features could arise from the bone structure buried underneath (see the image at the top of the post). A 3-D image from a computer tomography (CT) scan of the skull was obtained, and a craniofacial superimposition was conducted to determine if the skull could belong to Miller. The superimposition method used in this case was to overlay the CT image of the skull onto Miller's postmortem photograph. In addition to the craniofacial superimposition, the images were juxtaposed to compare similarities or differences in facial morphology between the skull and photograph. The researchers note that while "superimposition methods can be used to exclude identifications" (they concluded that the skull could not have belonged to Chadwell, for example), they shouldn't be used as a conclusive method of identification. "In this case," they write, "there were sufficient similarities between the skull and Miller's photograph; therefore, the skull could not be eliminated as possibly being that of Miller." Determining whether the skull really does belong to Miller could involve digging up whatever person (or persons) is buried at his gravesite in Missouri. As Hayes Scriven, executive director of the Northfield Historical Society, explained in an interview with Kansas City's Liberty Tribune last year: "If we find out that it's not Miller in the grave and it's someone else, or it's a compilation of people, or it's William Chadwell, that's a big deal historically." The researchers' findings are published in the latest issue of the Journal of Forensic Sciences. Big tip of the hat to @DrRubidium for the tip!